Caolan Lavery opened the scoring with a superb shot from the edge of the penalty area. 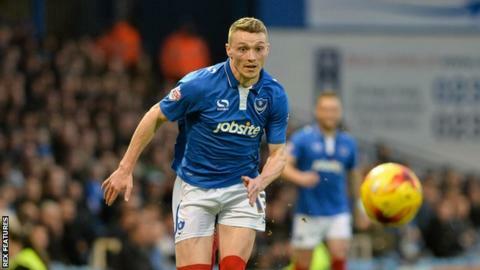 Portsmouth scored two in each half to thump disappointing Hartlepool. The hosts took the lead when Caolan Lavery curled a superb effort in after 12 minutes from the edge of the box. Visiting defender Adam Jackson diverted a Ben Davies centre into his own net to make it 2-0 to Pompey at the break. Marc McNulty teed up Gareth Evans for the third before the former got on the scoresheet with a calm finish beyond Pools keeper Trevor Carson from an Enda Stevens pass. "The win is good for the lads going into the start of the Christmas period and obviously the four goals are an extra bonus. "Hartlepool are a good team. As you've seen in spells today, they can handle the ball, they offer a threat at the top end of the pitch and they do make you work. "I think we have found a little bit of momentum in our play and in our fluency, certainly in areas of the pitch. "I personally think we can get a little bit better with a little bit more hard work and the lads are on that page at the minute." Match ends, Portsmouth 4, Hartlepool United 0. Second Half ends, Portsmouth 4, Hartlepool United 0. Attempt missed. Ben Tollitt (Portsmouth) left footed shot from the centre of the box is just a bit too high. Goal! Portsmouth 4, Hartlepool United 0. Marc McNulty (Portsmouth) right footed shot from the centre of the box to the bottom right corner. Assisted by Enda Stevens. Mikael Mandron (Hartlepool United) wins a free kick in the defensive half. Substitution, Portsmouth. Matthew Clarke replaces Christian Burgess because of an injury. Mikael Mandron (Hartlepool United) is shown the yellow card for a bad foul. Foul by Mikael Mandron (Hartlepool United). Substitution, Portsmouth. Adam McGurk replaces Caolan Lavery. Substitution, Hartlepool United. Mikael Mandron replaces Scott Fenwick. Substitution, Hartlepool United. Brad Walker replaces Carl Magnay. Corner, Portsmouth. Conceded by Rhys Oates. Corner, Portsmouth. Conceded by Michael Duckworth. Attempt missed. Caolan Lavery (Portsmouth) right footed shot from the centre of the box is close, but misses to the right. Hand ball by Carl Magnay (Hartlepool United). Attempt missed. Jake Carroll (Hartlepool United) left footed shot from very close range is just a bit too high. Goal! Portsmouth 3, Hartlepool United 0. Gareth Evans (Portsmouth) right footed shot from the centre of the box to the bottom right corner. Attempt saved. Marc McNulty (Portsmouth) right footed shot from the centre of the box is saved in the bottom left corner. Rakish Bingham (Hartlepool United) is shown the yellow card. Attempt missed. Kyle Bennett (Portsmouth) left footed shot from outside the box is close, but misses to the left.